HSBC, Lloyds Banking Group and RBS are the latest firms found to have used dubious 'legal' tactics to pressurise indebted customers into paying. 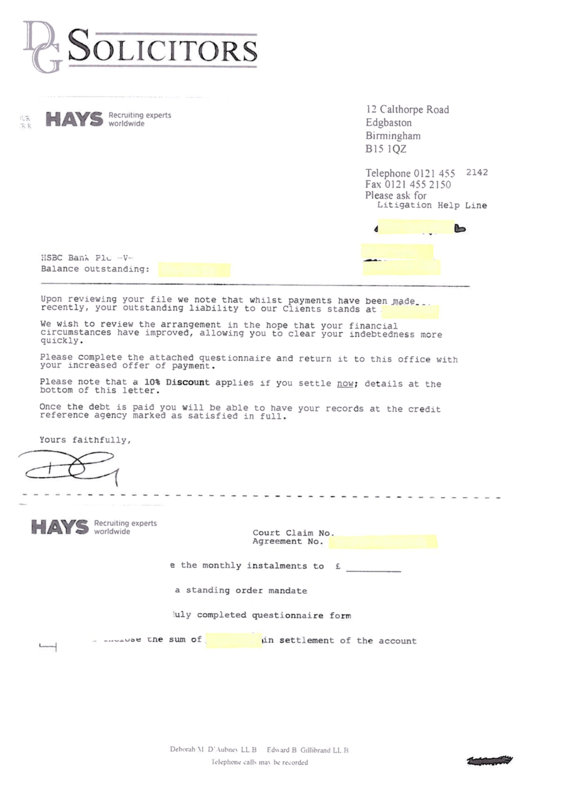 MoneySavingExpert.com has received copies of a number of misleading letters from the banking giants. The banking trio used letters that may have appeared to have come from independent solicitors, when they were actually from in-house firms or simply from in-house solicitors. HSBC: Customers received letters from a firm called "DG Solicitors". But HSBC admits the firm was actually its in-house solicitors. It stopped using this in January 2014 and now sends letters under the HSBC brand. 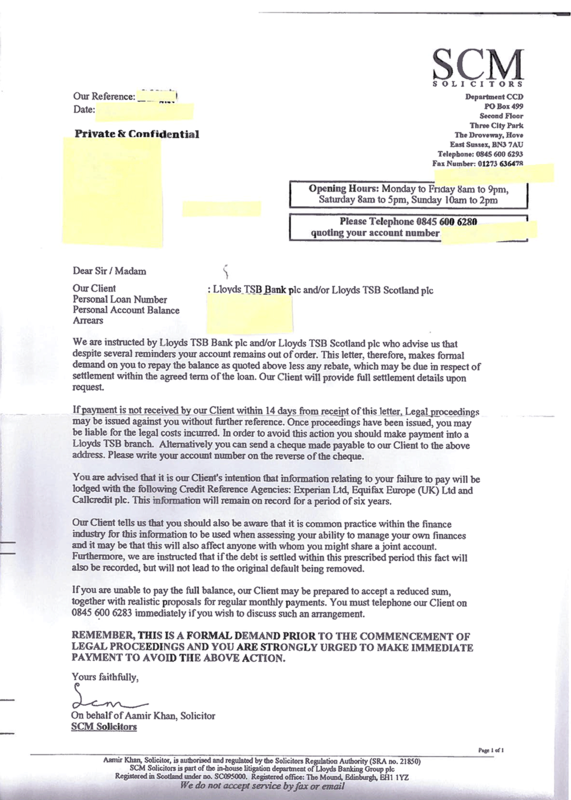 Halifax/Lloyds TSB: Customers were sent letters from a solicitors 'firm' called "Sechiari, Clark & Mitchell", or its alias "SCM Solicitors". Lloyds has confirmed that since 2011 this firm has been its in-house solicitors, and at the bottom of one of the letters MoneySavingExpert.com has seen it says SCM is Lloyds' Banking Group's "in-house litigation department". However it says it made the decision earlier this year to "phase out" the use of SCM. NatWest/RBS: Customers were sent letters from "Green and Co. Solicitors". RBS told MoneySavingExpert.com that this is an established law firm, but adds that it will make it clearer to customers that it's also the firm's in-house team. Andrew Tyrie MP and chairman of the Treasury Committee, today says he will write to the banks involved following allegations made in other news publications as "customers should know who they are dealing with – it seems they may not have done". There is no suggestion that this tactic is illegal, but we think it's misleading. It comes as over 300,000 graduates were sent fake 'debt collection firm' letters by the Student Loans Company. Guy Anker, MoneySavingExpert.com managing editor, says: "Banks have been kings of deceiving customers over the years, just witness the mass mis-selling of PPI. And this is yet another devious way to manipulate loyal and unsuspecting customers, in this case those most vulnerable who are in financial difficulty. "Thankfully HSBC, Lloyds and RBS have either stopped or plan to stop using this deceptive tactic, but it doesn't excuse their shameful behaviour." HSBC: "All customer letters from DG Solicitors were compliant with the Office of Fair Trading debt recovery rules and made it clear that it was HSBC's in-house firm of solicitors and that its people were HSBC employees. HSBC stopped using its legal firm DG Solicitors in January 2014 and legal correspondence to these customers is now under the HSBC brand." Lloyds Banking Group: "We continue to simplify our business to ensure that we support our customers in the most simple, straightforward and transparent ways possible. "As part of the simplification of our collections and recoveries operation from earlier this year we made the decision to phase out the use of SCM." RBS: "Our customers should never be in any doubt about who they are communicating with. We have reviewed our policies in this area and will stop the use of any solicitor or debt collection brand names in correspondence with our customers that could cause confusion." How do I check if a solicitor/law firm is legitimate? England and Wales: All lawyers must have a 'practising certificate'. If you're unsure, ask to see the certificate or contact the Solicitors Regulation Authority on 0121 329 6827. Alternatively, you can use the English and Welsh Law Society's Find A Solicitor tool, which lists all solicitors who currently hold a practising certificate, barring those who've asked to have their names removed from the directory. Scotland: Lawyers are registered on the Law Society of Scotland's online directory, so you can use this to check. Northern Ireland: Check the Law Society of Northern Ireland's online directory. If the lawyer doesn't appear to be registered, contact the Law Society for a further check on 028 9023 1614 (select option 4) or by emailing info@lawsoc-ni.org. What should I do if a law firm is fake? England/Wales: Report it to the Solicitors Regulation Authority on its fraud line (0121 329 6827), or email fraud@sra.org.uk. If you've not already been in touch, they'll first double-check if the solicitor is registered. It may then take action including opening an investigation or referring the case to the police, depending on the scenario. In some cases, you may be asked to refer it to the police yourself, in which case contact Action Fraud – the UK's fraud and internet crime reporting centre. Scotland: Report it to the Law Society of Scotland on 0131 226 7411 (ask for the registrar's department when you get through) or by email to professionalpractice@lawscot.org.uk. They'll then open an investigation or refer the case to the police, depending on the scenario. Northern Ireland: The Law Society of Northern Ireland won't investigate claims itself. Instead, report it to Action Fraud. Should I respond to demands for money? Whether you receive a letter from a real or fake law firm, it doesn't affect the fact you're still liable for any debts you owe. If you're struggling to repay, speak to a free debt advice agency for help in coming an arrangement with your lender. See our Debt Problems guide for a list of agencies and how to get help.